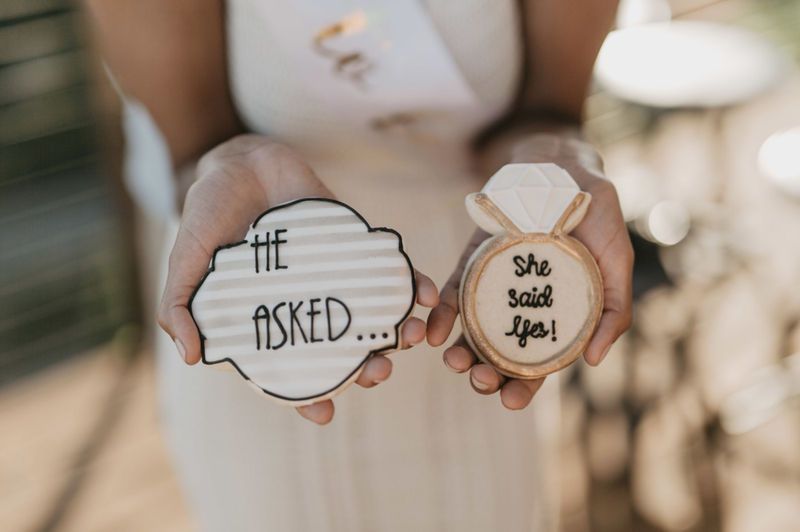 Wedding, Engagement & Bridal Rings | Rhodes Wedding Co.
We love Angel + Brandon’s love story and are grateful to be part of it. Brandon is my younger brother by one year + one month and I am so happy he found someone to love him in the way he deserves to be loved. Angel describes him to the core of his being. Her words truly encapsulate who he is. It’s such a gift to be able to really see the one you love, and she does. Their love is big and fast and ever-growing. They were married on our Grandma’s beautiful property in Michigan that has been in our family for generations. It was beautiful to hear them read their vows to each other with tears in their eyes. We loved creating Angel’s beautiful yellow gold one of a kind engagement ring with a white diamond. It’s the perfect balance of classic and unique, so perfectly Angel. The full bridal set incorporates two leaf rings, one yellow and one rose. For Brandon we created our Autumn Groves design in yellow gold and engraved “you’re my person” on the inside. It’s been such a joy to watch their relationship bloom into something so incredible. 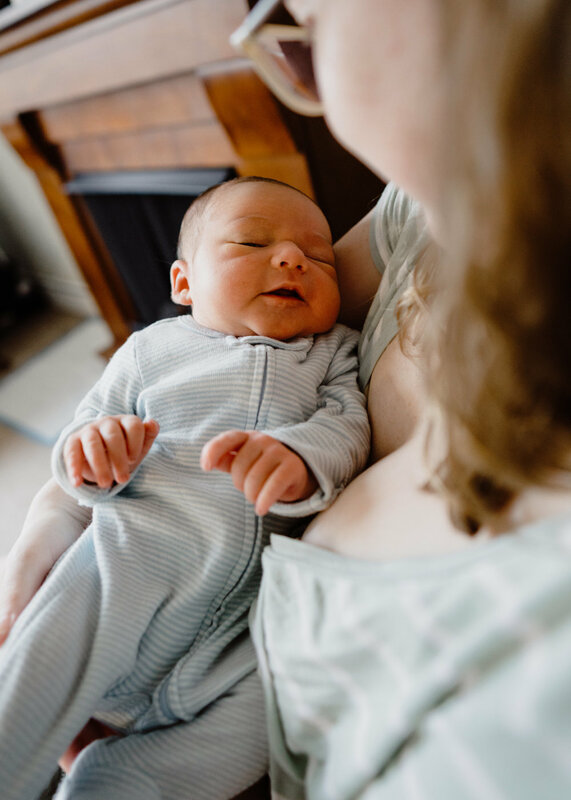 And just last week, a day before Valentine’s Day they welcomed a darling baby girl into the world. Emma James Easton in all of her perfection. It was so heart warming to see my brother hold his daughter. What a moment. Angel is already such a good mom. I can’t wait to see her raise an amazing girl. I am so proud to call these two (and now three!) family. Being part of their love story that is ever folding is an honor. I love you Brandon, Angel + baby Emma. Thank you for choosing us. We've made it a point throughout our relationship to not get bogged down with the "what if's". 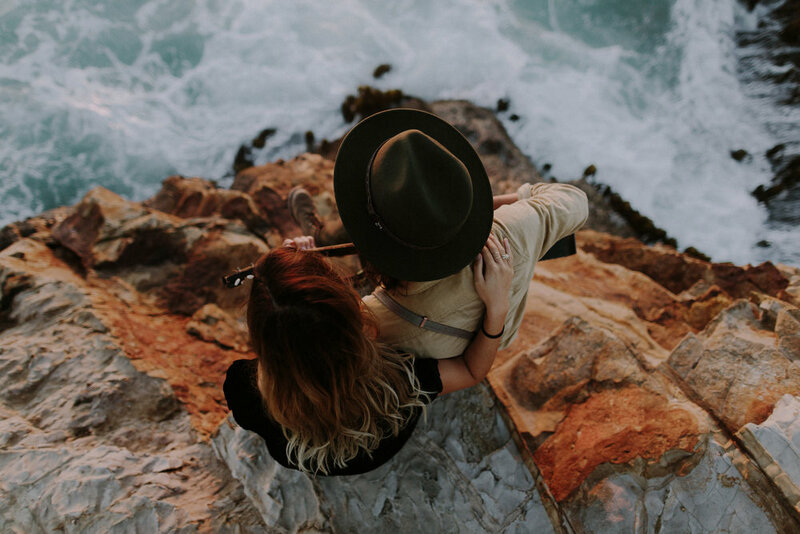 We are both firm believers in the concept that there will always be a reason not to do something, and we've gone to extreme measures to make sure that we don't allow that to prevent us from taking chances and experiencing life. My dad told me a long time ago, "There's no such thing as a right decision or a wrong decision. You've just got to decide. You really can't know if it was the right choice until much later. Not to decide is to decide to not experience anything." I like to think of that as my mantra for life, and I'm so glad that I've found someone who's willing to take the big leaps with me. We are so honored that the lovely Lisa Origliasso of The Veronicas chose us to create the wedding band her now-husband Logan Huffman. The love they have for each other flows from every image and makes my heart want to burst. 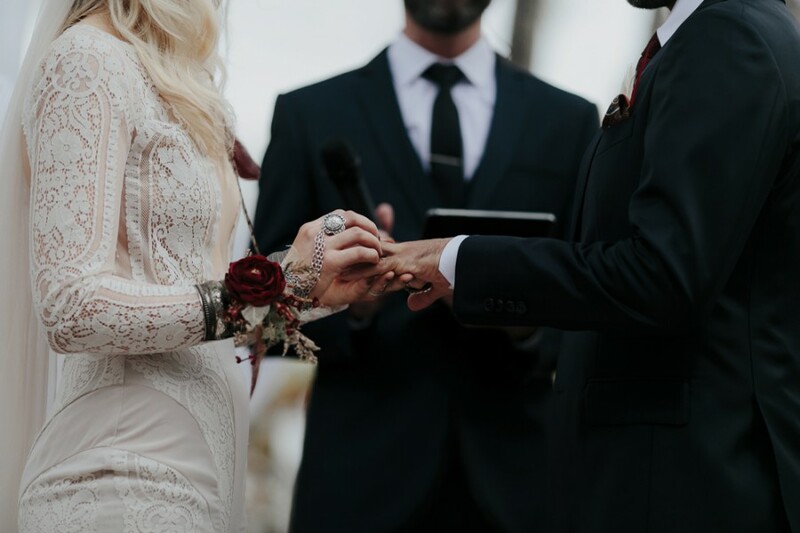 They’ve been an absolute dream to work with and we are so grateful to have them as clients and tell their incredible love story. And on top of it all, their stunning wedding was featured in Vogue and we are over the moon excited about it. 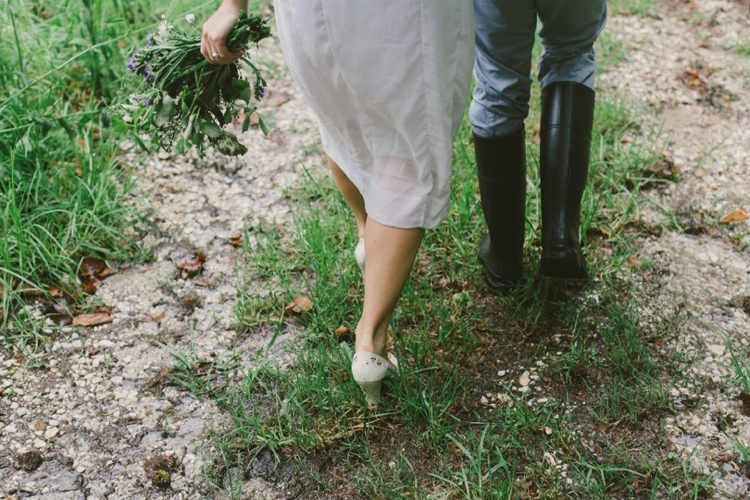 Here are some of our favorite captures from their special day on the Sunshine Coast photographed by Joey Willis. 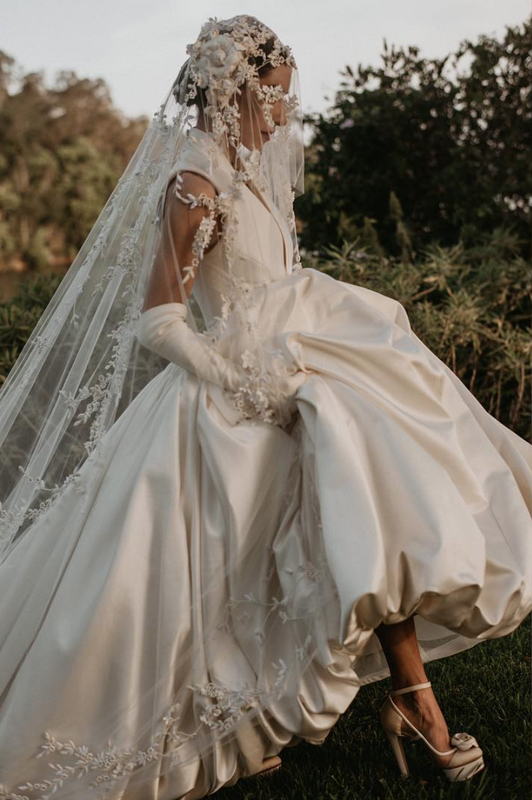 Lisa wore a J’Aton Couture gown that absolutely took my breath away. Timeless. 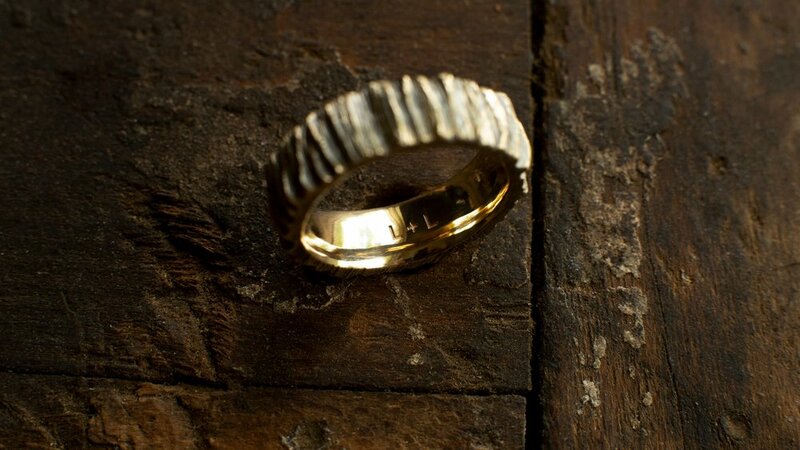 The piece Lisa had us design for Logan was our Autumn Groves design in yellow gold. 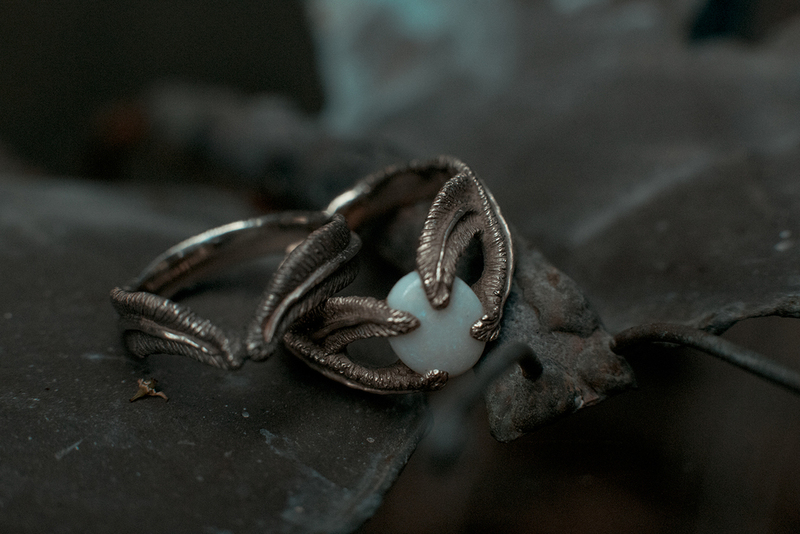 We designed a band for her that features two leaves together, like lovers completing one another. In the evening, Lisa changed into a second J’Aton Couture gown. And this one is just as beautiful. 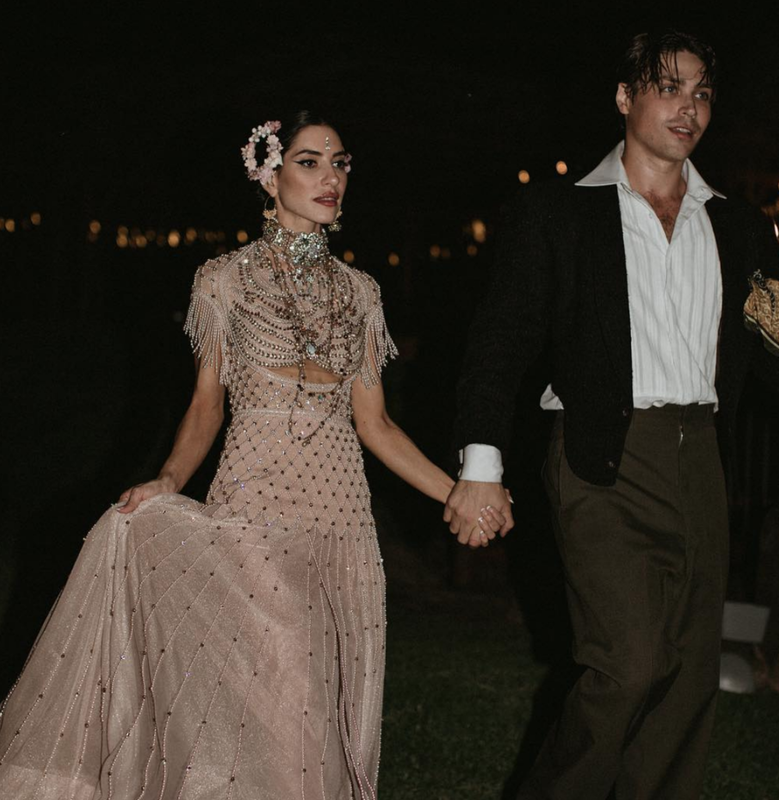 Read more about their love story and see more captures from their wedding in their Vogue feature here. This month is our three year anniversary of this session with Nirav. I can't believe how much time has passed. I am flooded with gratitude as I look back through these captures. Three years ago we were still living out of suitcases, wandering the globe making memories and telling love stories. 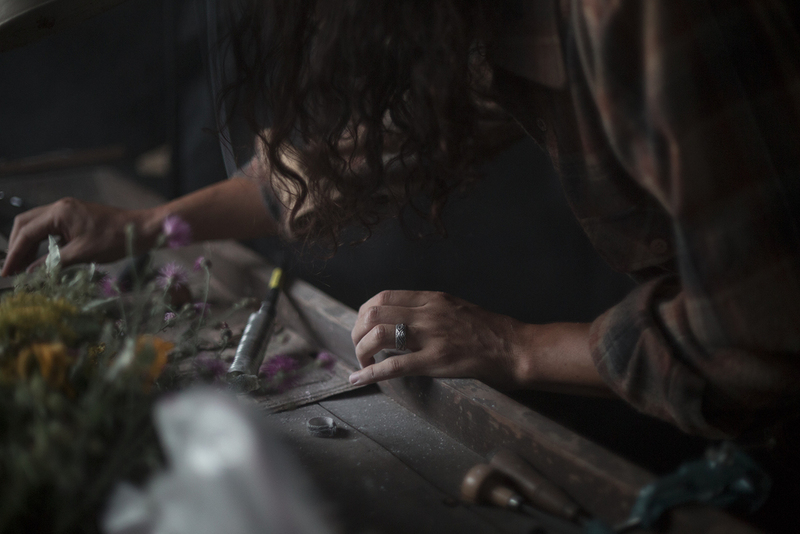 We had a traveling workshop that Perry brought along with him wherever we traveled, creating new pieces inspired by the ever changing landscapes we were exploring, telling the love stories of people we met. Nirav has been a true gift to us and I am honored to call him a friend. Three years ago I came across his incredible work and was moved by the emotion of each capture. 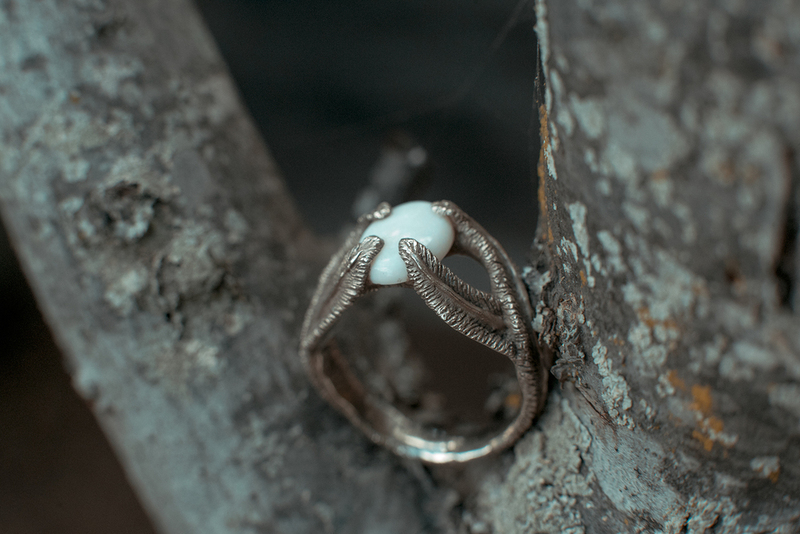 I reached out to him to inquire about him photographing our rings on a model, but he replied, "I want to photograph you two." I was honored that such an intentional, heartfelt photographer was interested in telling our story. 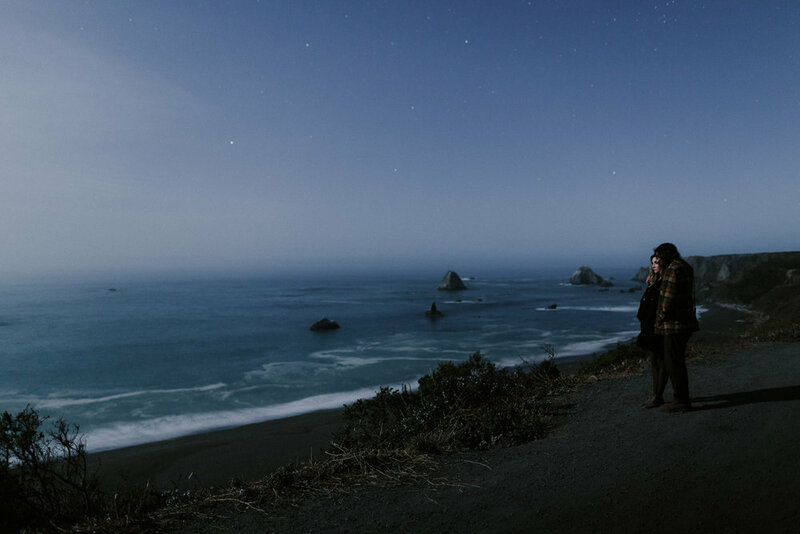 We spent a weekend together among the redwoods in Northern California and along the breathtaking cliffs of the coast. He took us to his favorite town to see his favorite beach. He told us his story, and we shared ours. We talked dreams, passions, work, God, family — all the things that make life beautiful. I wouldn't trade that weekend with Nirav for anything. He will forever hold a special place in my heart. When he sent us the photos he captured I was moved to tears. As I scrolled through the images I could see our love story unfold. I am so grateful that creating Rhodes Wedding Co. has led me to work with such an amazing soul. I will cherish these captures for a lifetime and the friendship that bloomed with Nirav has changed my life. I remain overwhelmed with gratitude. 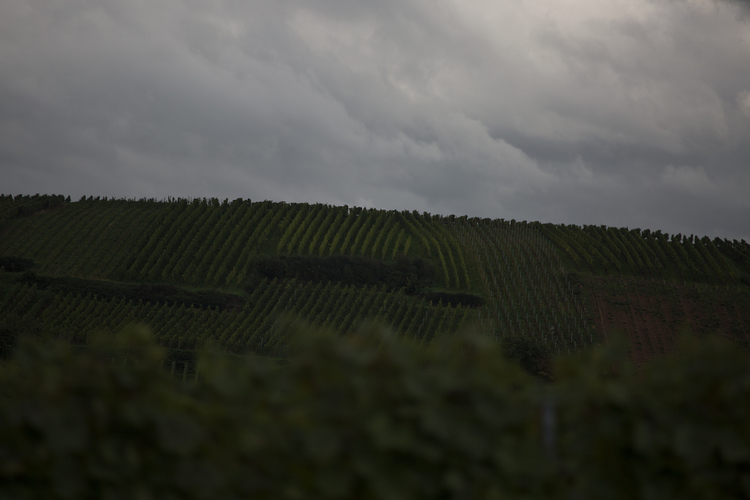 Here's a look through just a handful of his stunning captures... Watch the full story unfold on his blog here. Watch the full story unfold on his blog here. 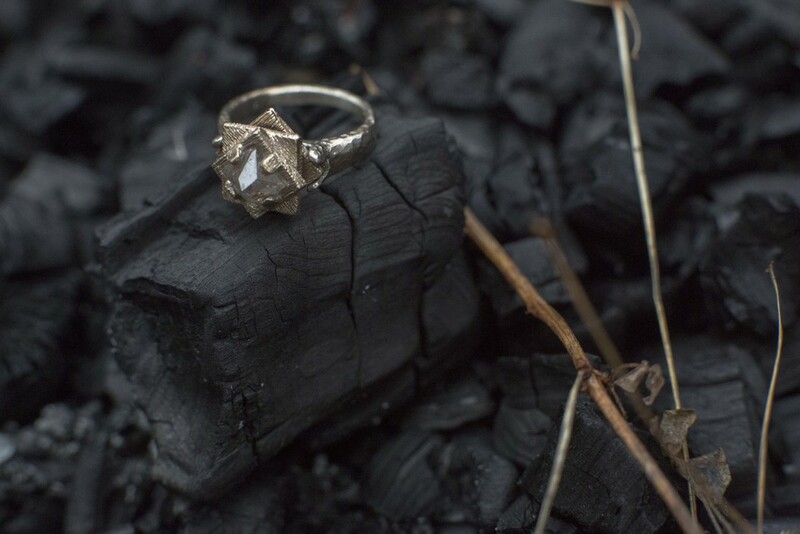 Connor reached out to us to make an engagement ring for a diamond that was his grandmother's — an heirloom that had been in his family for generations. 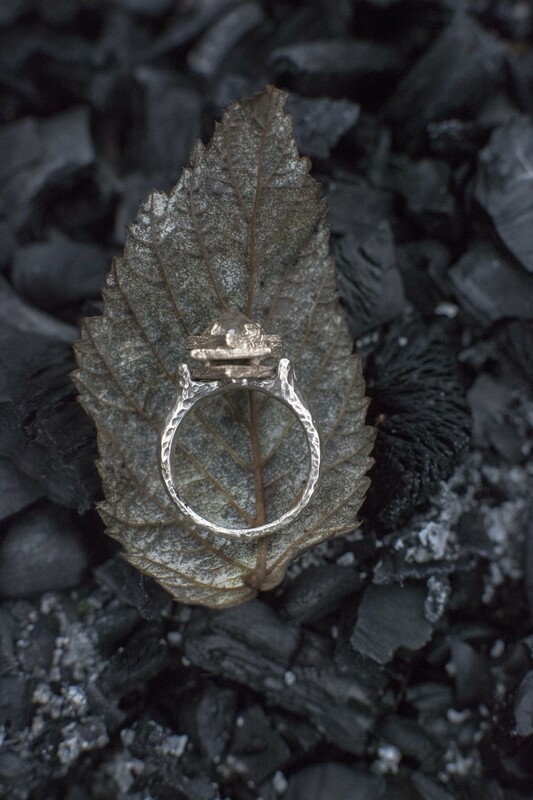 We were honored he chose us to create this special one of a kind engagement ring. 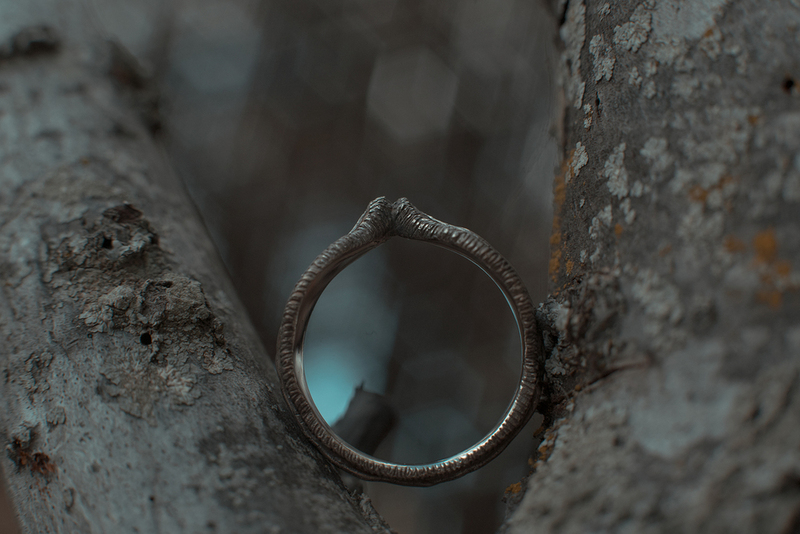 He loved the branch texture of our Portland band so we worked that into the design of hand carved engagement ring and we have to say, it came out beautifully. 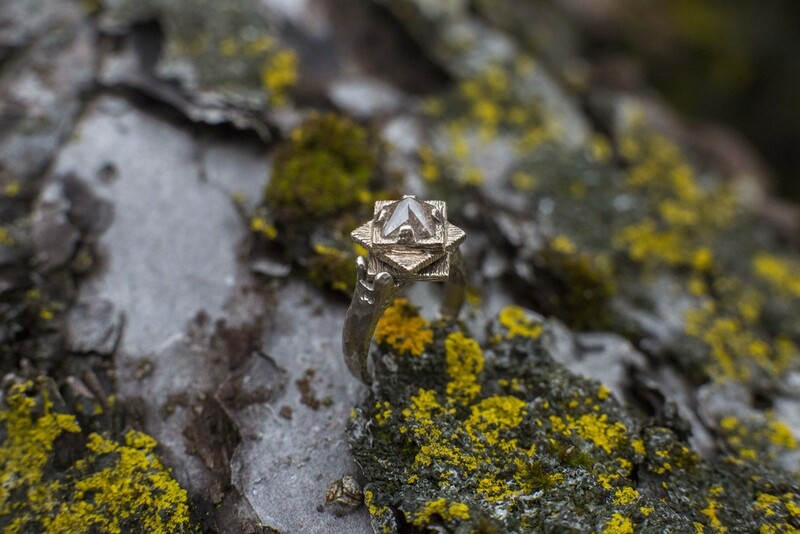 If you're interested in speaking with us about creating a unique engagement ring using and an heirloom stone (or having us source the stone for you), please don't hesitate to email us at info@rhodesweddingco.com. We are here for you when you need us. 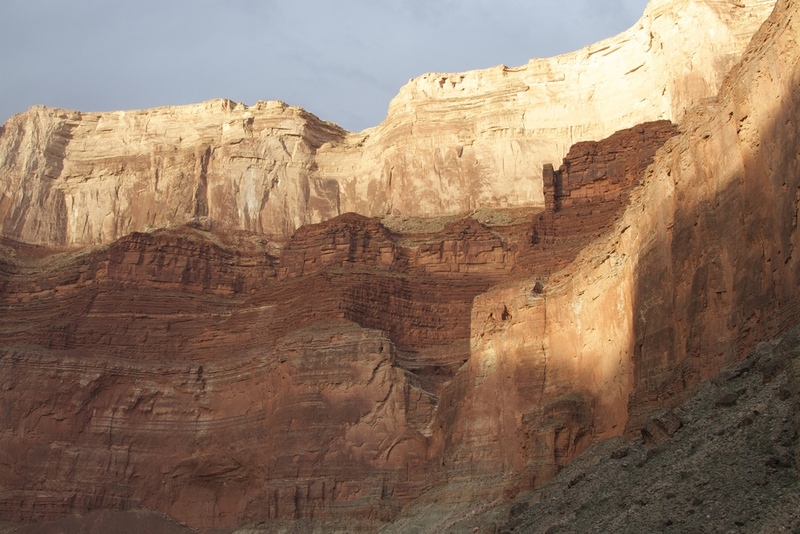 On proposal day Connor took Devyn on the same hike where he first asked her to be his girlfriend. 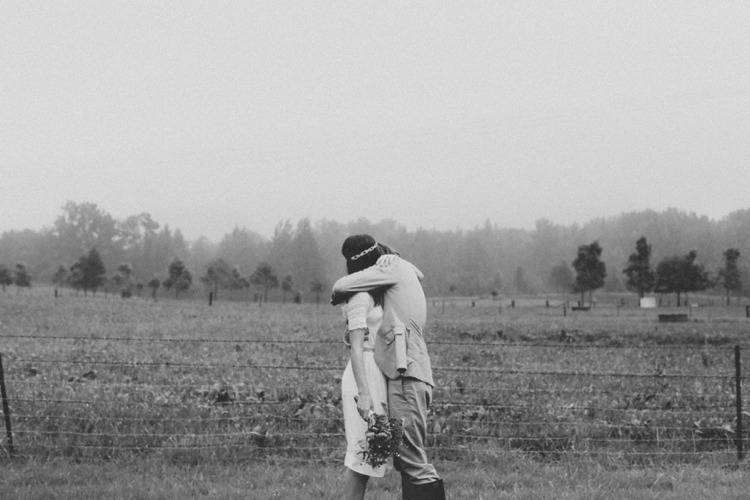 I live for love stories that come full circle like this — and we got to be part of it! 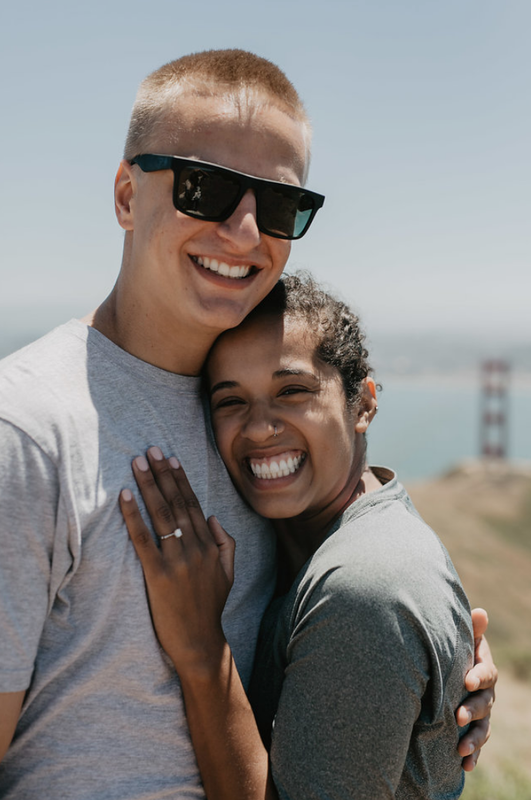 He got down on one knee and asked her to marry him with the incredible Golden Gate Bridge as the backdrop. Swoon. 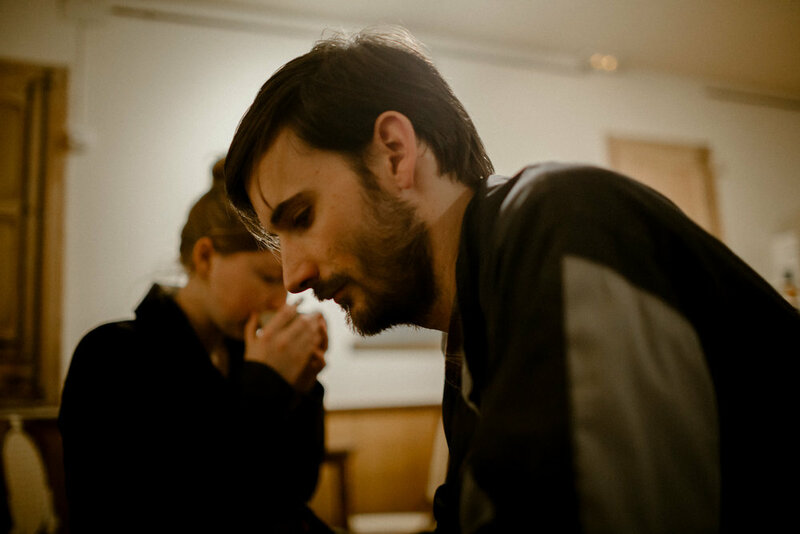 Now, enjoy these stunning captures by Iron and Fern of the incredible moment. I can't wait to see the wedding photos of these two love birds. 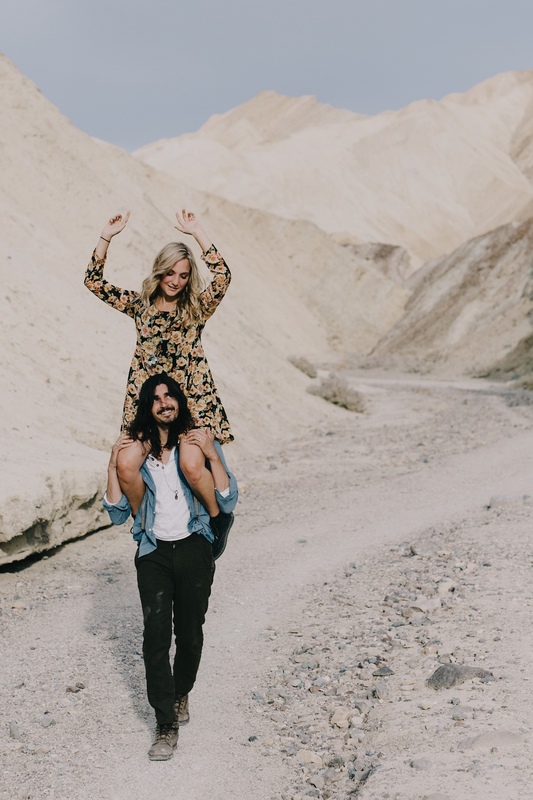 Our beautiful clients Brittany and Bronson were featured on Nouba and we're swooning. 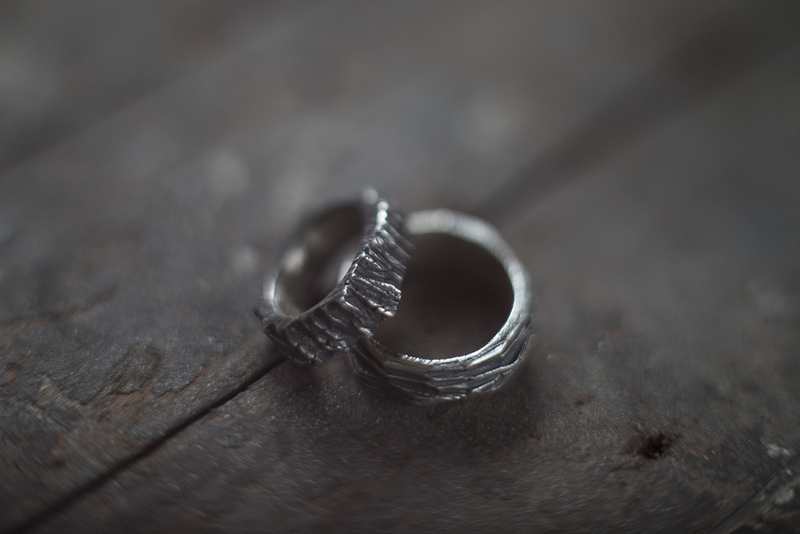 For Bronson, we created an extra wide Grade in white gold—it looked perfect on him. 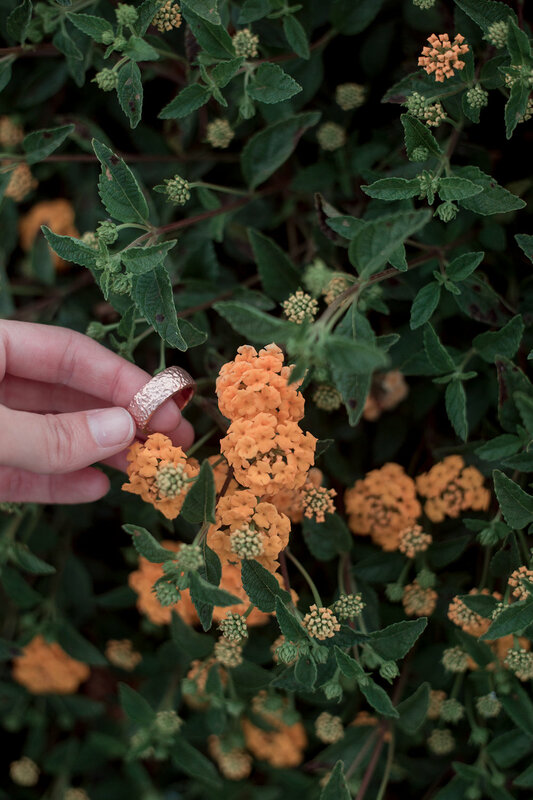 For Brittany, we designed a wedding band that fit around her grandmother's eternity ring. It was a double wedding band with a subtle Grade texture that she could wear on it's own or if she was in the mood for diamonds then she could add her grandmother's ring to fit in-between ours. We're so grateful to be part of this incredible love story. 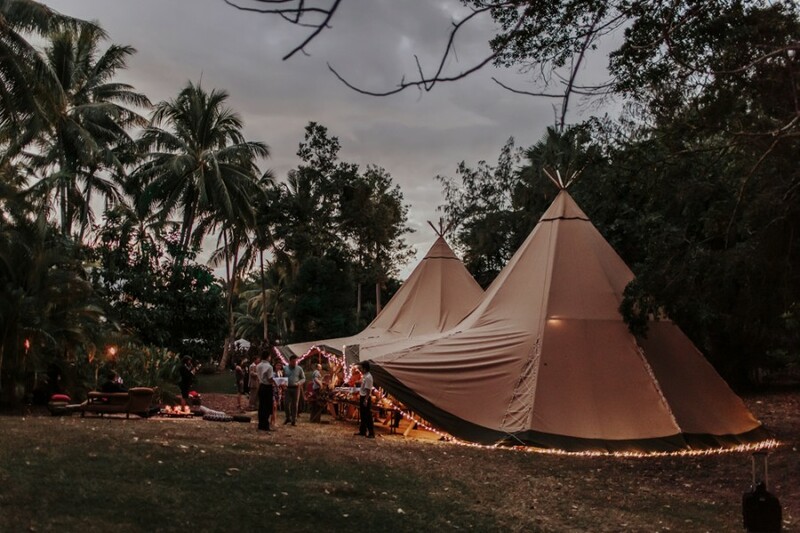 A cyclone destroyed their original wedding venue in Vanuatu and they had to come up with a new plan in just six weeks—but you would never have guessed it. 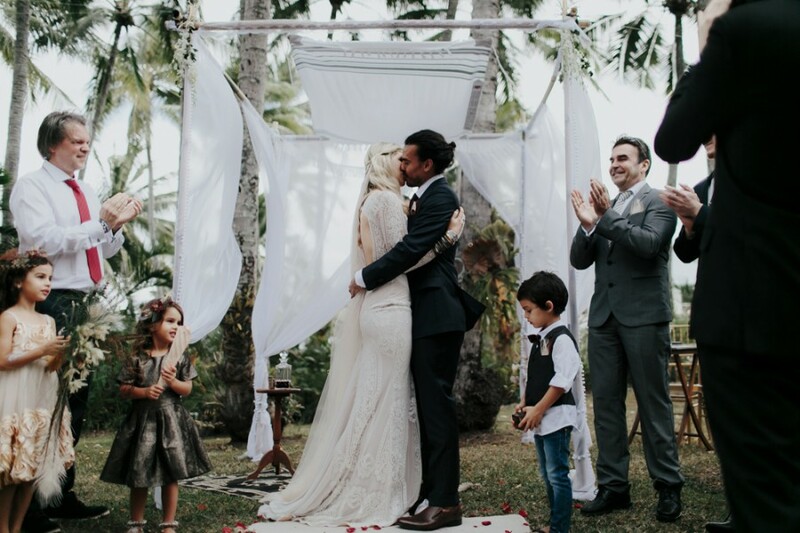 They had a bohemian-style wedding in Northern Queensland, Australia and it was absolute perfection. 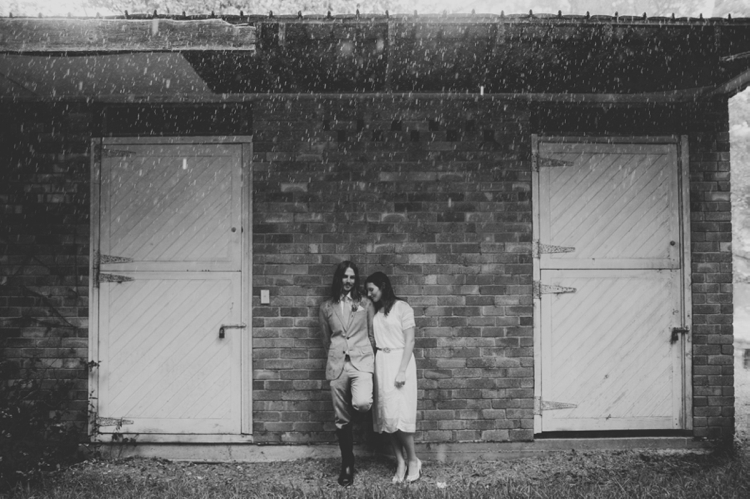 The talented Oli Sansom captured their special day. 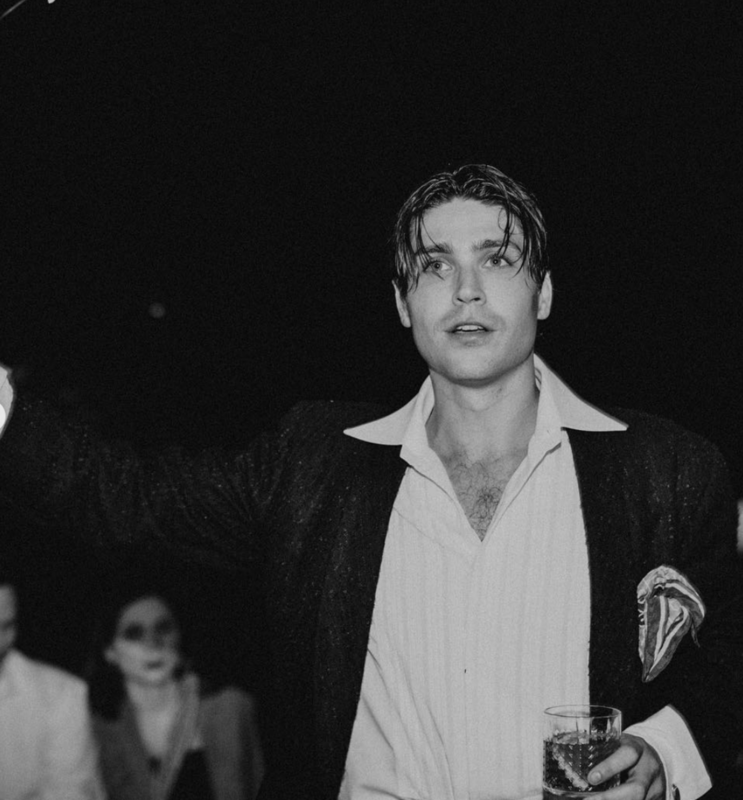 You can see some of our favorite photos below. 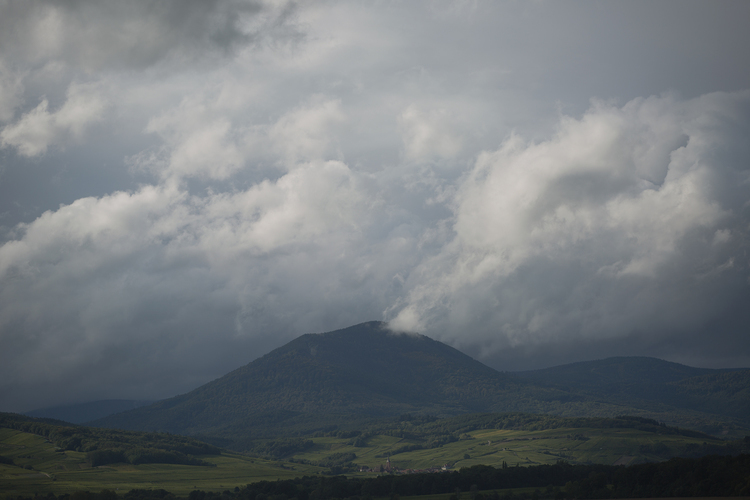 C2 Films captured this amazing day on film and you can watch it here. 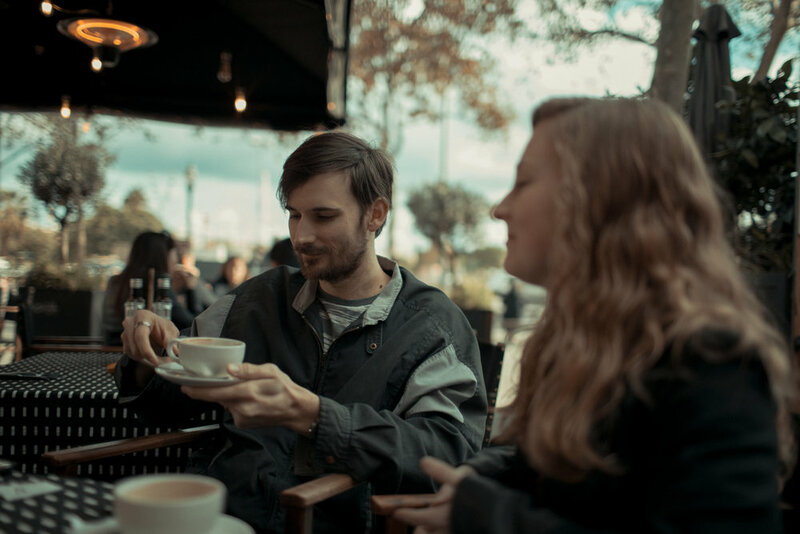 Read more of their story and see more of Oli's captures on Nouba's blog here. I've been following Philippa Stanton's art for her "5ftinf" for years and fall deeper and deeper in love with every capture. She is an incredibly talented artist that not only captivated me with her art but has moved me with her being, her heart. The way she looks at things and expresses her thoughts and musings inspires me to no end. She is such a kind and creative soul all the while being a strong force of and in nature. We're so honored to have collaborated with her to create a special piece that celebrates her life — the past, present and all that is yet to come. The Life Band represents being in the present moment, in love with life and living it to the fullest — and so much more — a promise to ourselves, and a reminder to make the most of here and now. 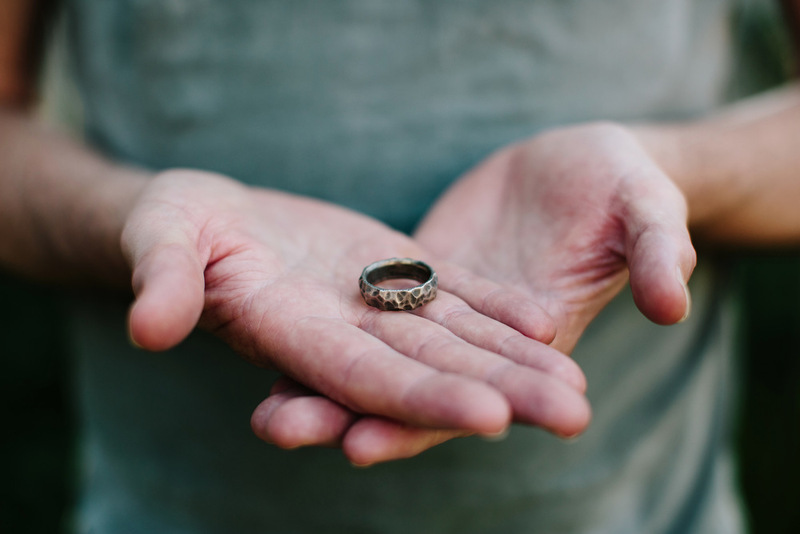 Since I got divorced I’ve never worn another ring but what leapt to my mind when I saw your website was that if I were to wear a ring again it should sort of be a life band, i.e. ; like a wedding band, but somehow representing a promise to myself; to be married to life itself, and all the joys and problems it brings with it. A ring is a living, moving thing; it would live with me and not just on me, and I will have to cherish it and look after it, like life. I don’t think even I had realised what it was going to mean to me; the lines, the marks…everything on that ring I recognise as part of me and my journey as well as my security; those scratches on the table have been made by either me or my son over the years; making things, scoring things, accidents... and there they are on my ‘life band’. As I’ve said before I don’t wear rings, but as soon as I saw this ring I absolutely knew I wanted to wear it forever ( something I really wasn’t expecting )…you have seen a part of my life and crafted it into the most beautiful thing ever and I can’t thank you enough. And if you would like a custom designed life band, please contact us at info@RhodesWeddingCo.com or you can fill out the form here. 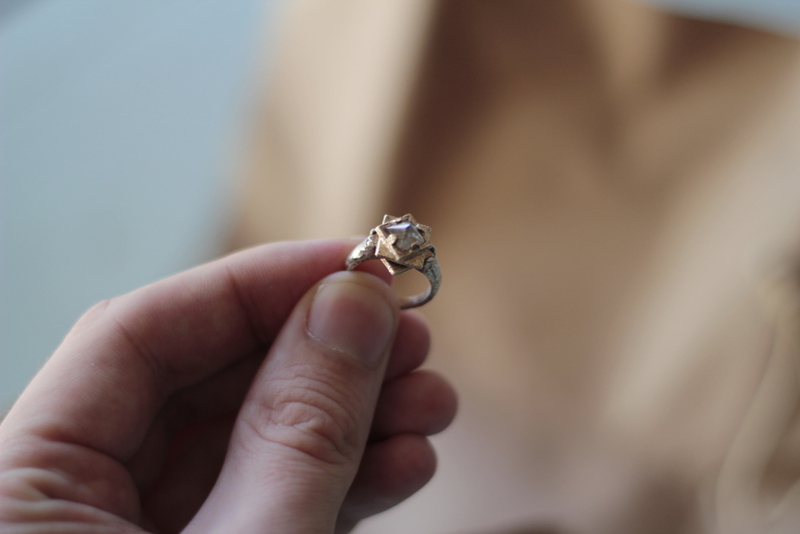 The darling Anya Kernes captured a few of our custom, hand carved rose gold engagement rings and stackable pieces. 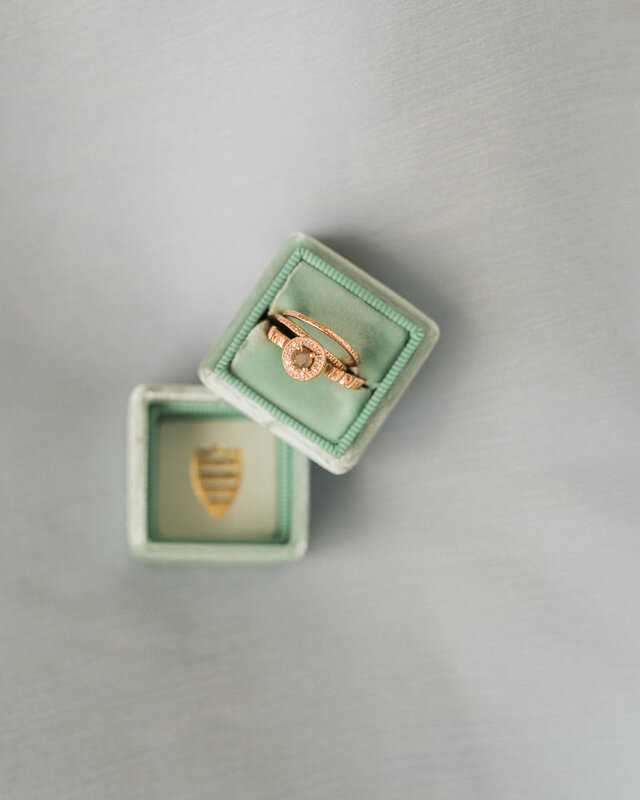 I love her soft, muted tones paired with the beautiful pastels of The Mrs Box ring boxes. 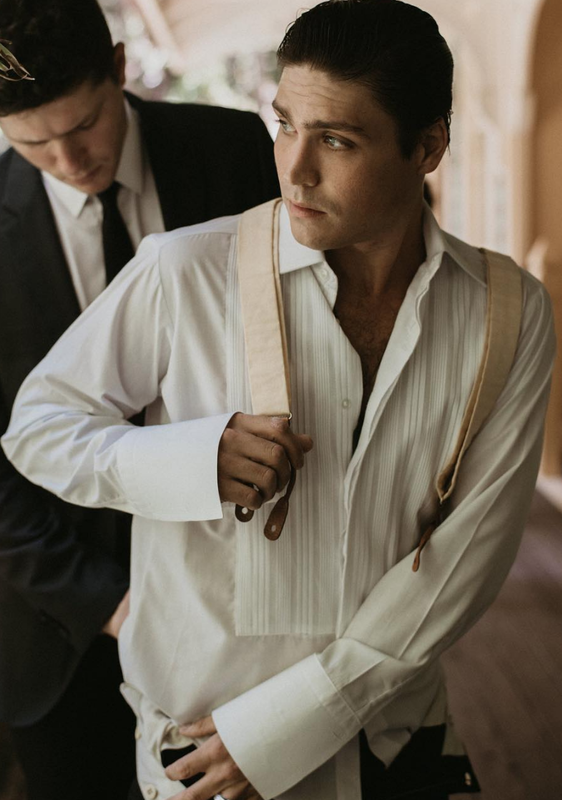 Anya is wedding and boudoir photographer based in Los Angeles. 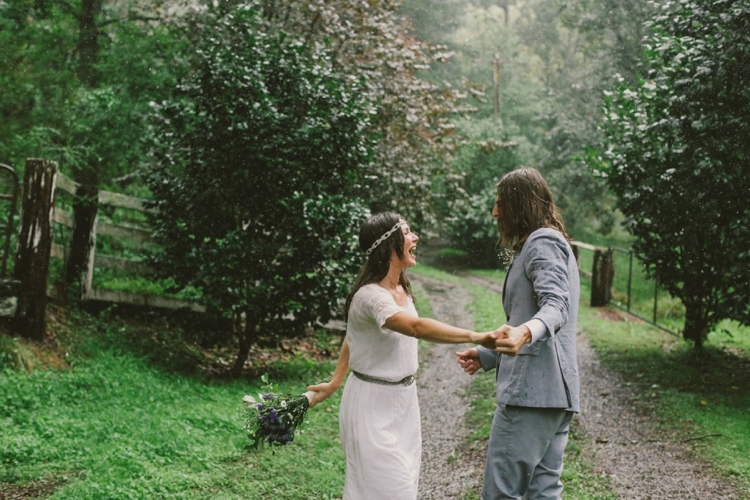 She shoots for emotion and we absolutely love her soft and romantic style. 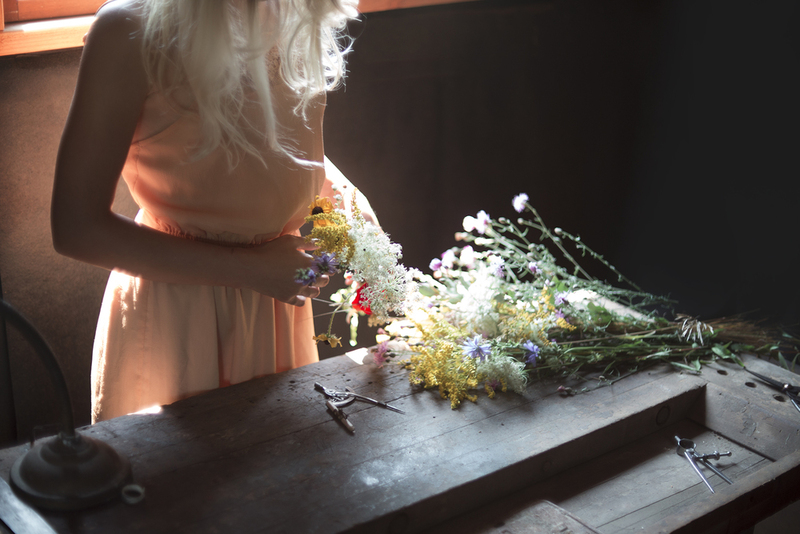 Head over to Anya's site here and make magic together. 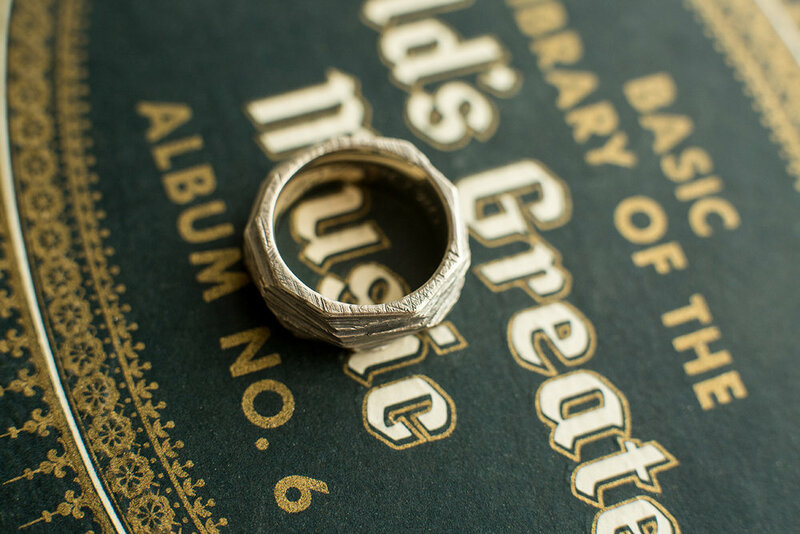 If you're interested in having us create a custom, hand carved engagement ring, shoot us an email at info@rhodesweddingco.com. 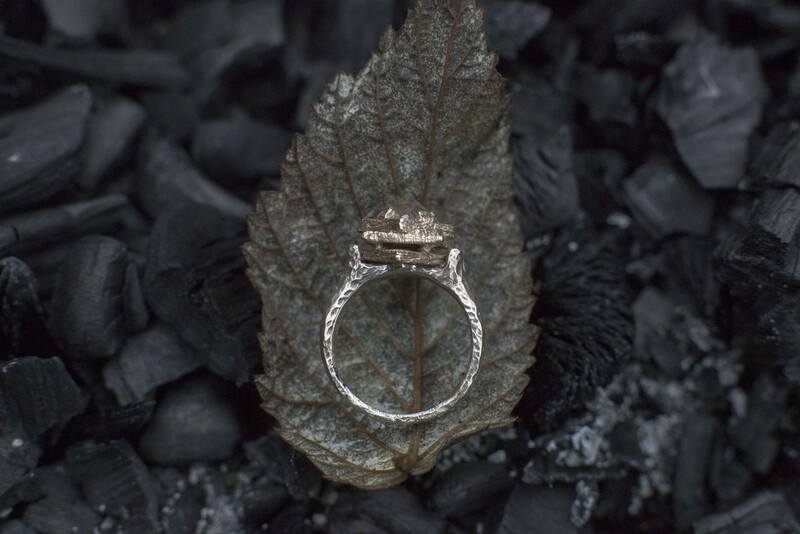 If you want to see more of the engagement rings we've designed, go here. 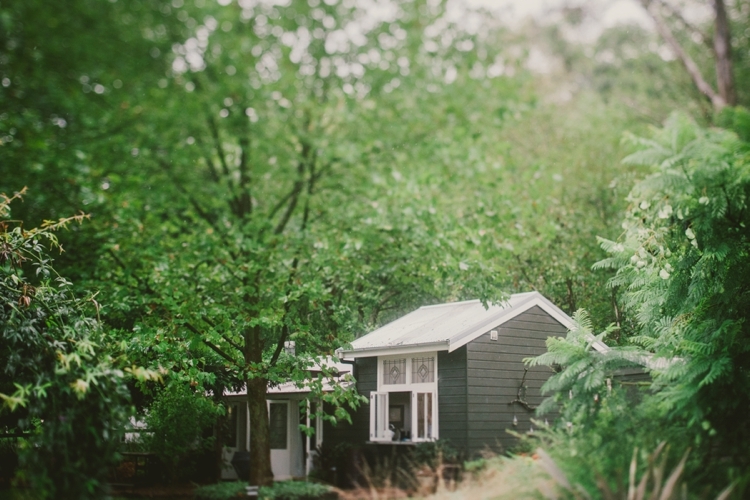 Inspiration for Rhodes Wedding Co. continues to build each and every time we visit my grandparent's place in Michigan. They had that kind of love that you think only exists in films—that fairytale love. 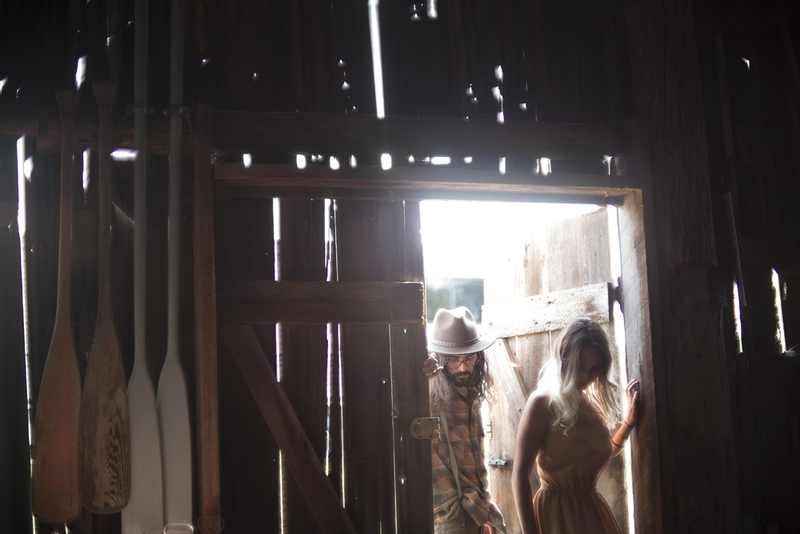 Spending so much time engulfed in their love in a house that was built with adoration and a barn that was worked in by my grandfather, Perry and I are constantly moved by a love that stood the test of time. While we are here, we're reminded of how love can truly take you places and how important that journey is to living a life of abundance. I believe this place is truly something special—and I just realized that Perry feels the same way. 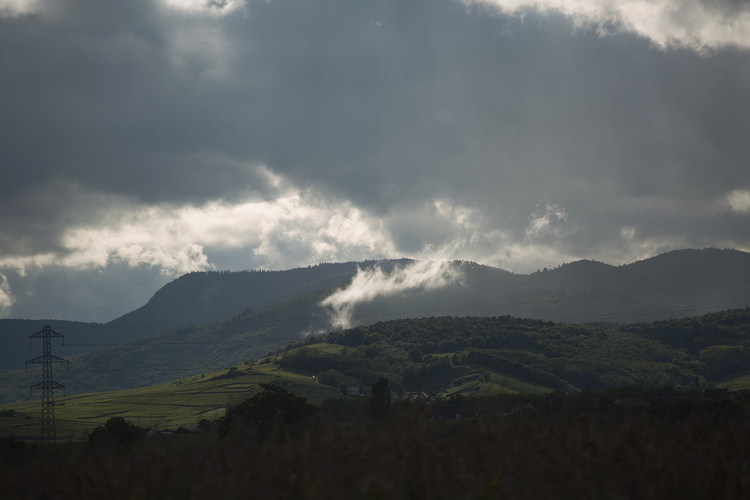 He penned this beautiful letter to me about our love, life and all that we create in this sentimental place. *These photos are featured in the "Tailor Made" issue of Livid Magazine. Thank you for following our journey. We’ve love to get to know you and tell your story. 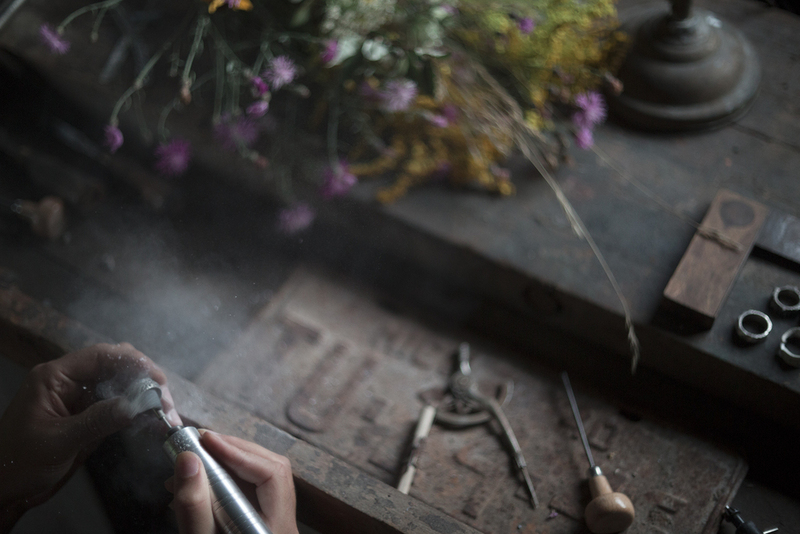 If you’d like something created, reach out to us below (or visit our Shop here). 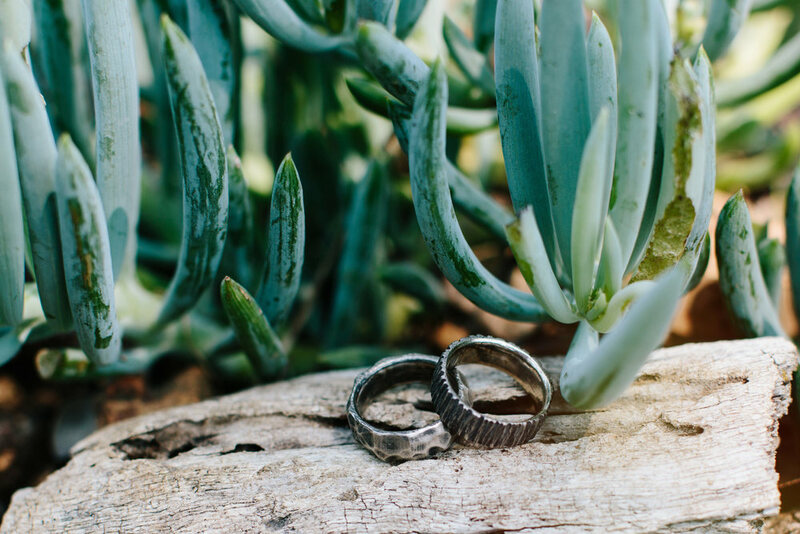 We're so excited to share these beautiful shots of a few of our men's wedding bands that the lovely and talented Bianca Kate captured. She was such a dream to work with and we couldn't be more happy with her photos. 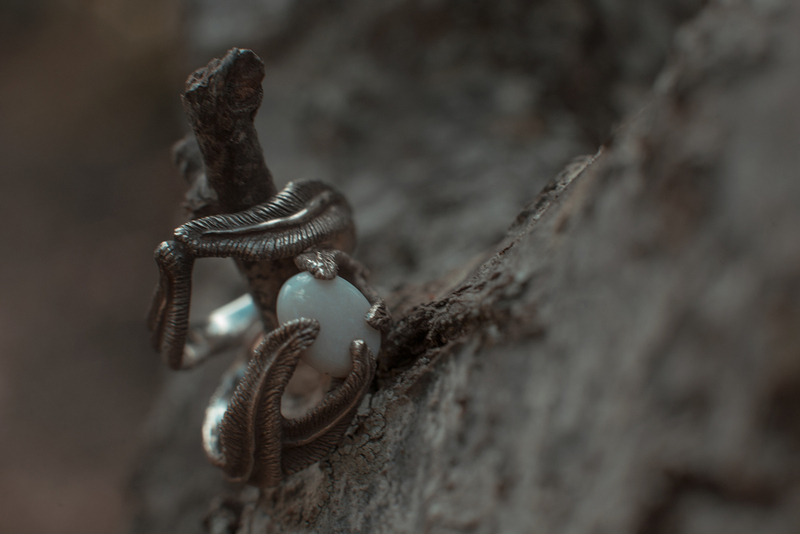 It's amazing to see another photographer's vision for our pieces, and one all the way from Australia! We're so grateful to have these images, and look forward to working with her in the future. We truly enjoy and feel honored when we get to work passionate photographers who are living out their dream and creating art for the world to see. 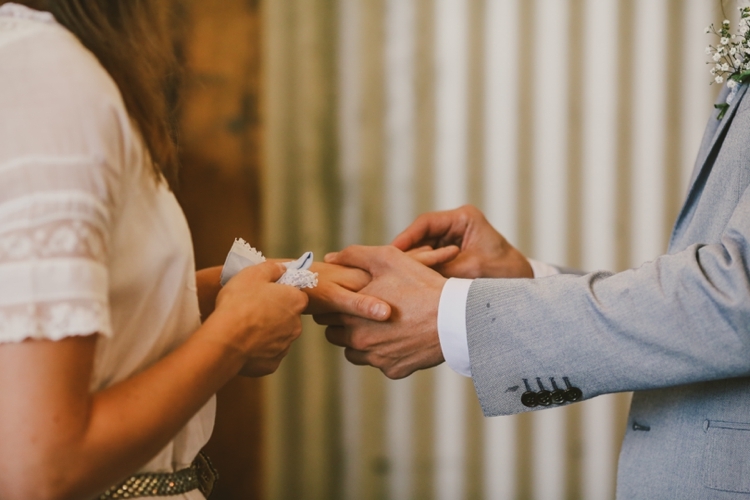 If you're interested in shooting our wedding bands or working together in any way, please reach out at info@rhodesweddingco.com. 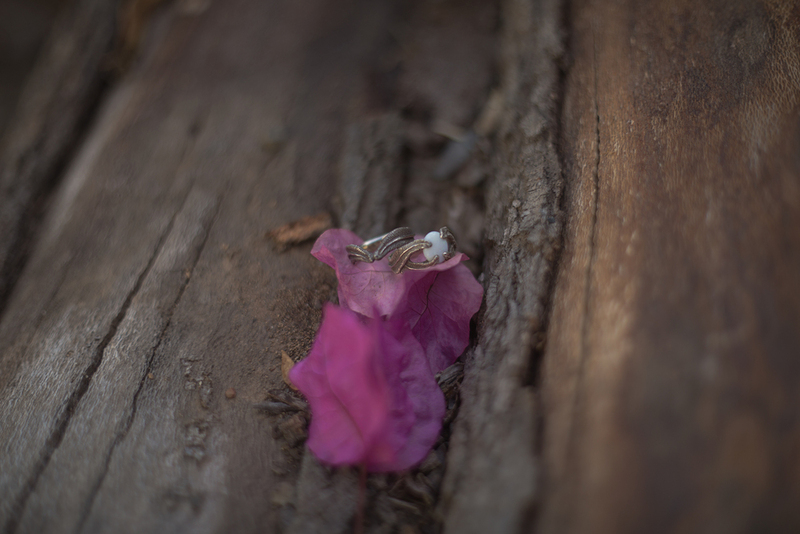 Take a look Bianca's work below, and keep in mind that she is available to shoot weddings Australia wide and beyond. Reach out to her here. 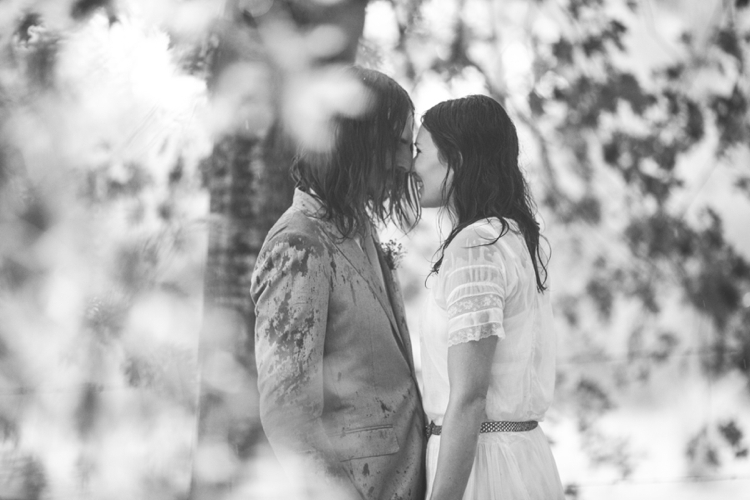 We shot with Phil Chester, the master of capturing lovers + their intimate moments. My heart soars as I see our love captured in this honest and special way. And we had the most incredible time with Phil. He is the kind of person that makes you feel like you've know him forever. He has such a genuine and real presence. The only thing we would of changed is that we wish we had more time with him—to talk music, hang out and share stories and of course, shoot together. We will definitely be showing up on his door step in Portland sometime soon. He won't be able to get rid of us. Have a look at his site and get all warm and fuzzy inside. See more photos from this magical day here. 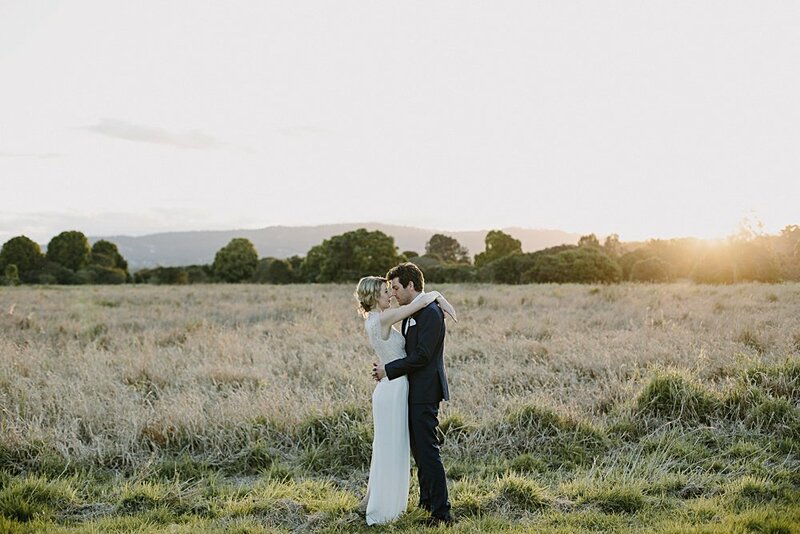 We're glad to be part of Holly + Dylan's love story. 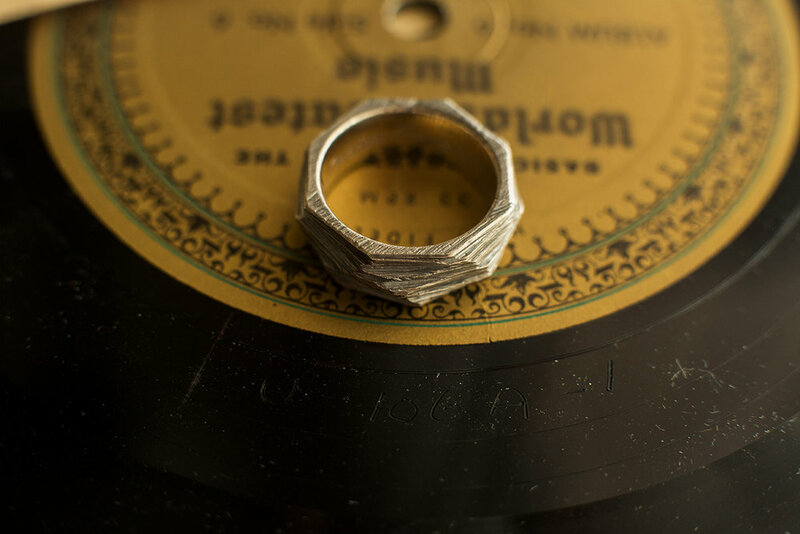 They chose us to create Dylan's wedding band and we were honored. We're grateful to take part in love all over the world. 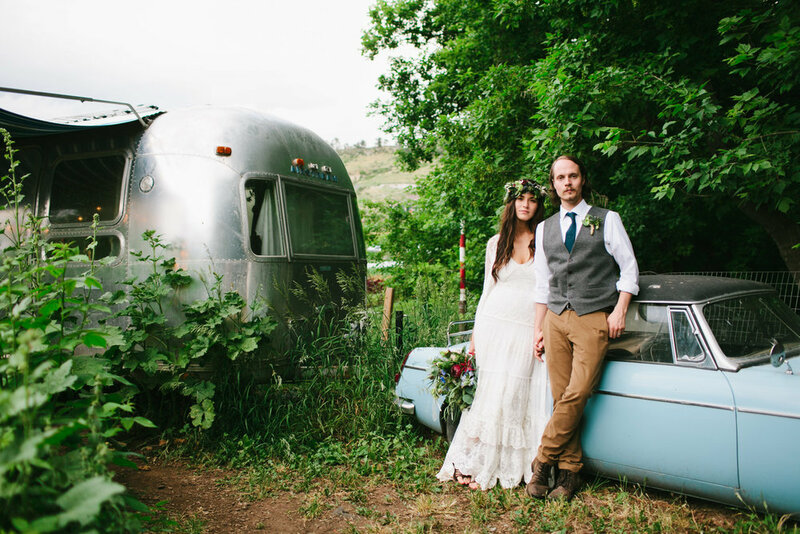 Have a look at their beautiful bohemian wedding captured by the talented Tayler Carlisle in Lyons, Colorado. 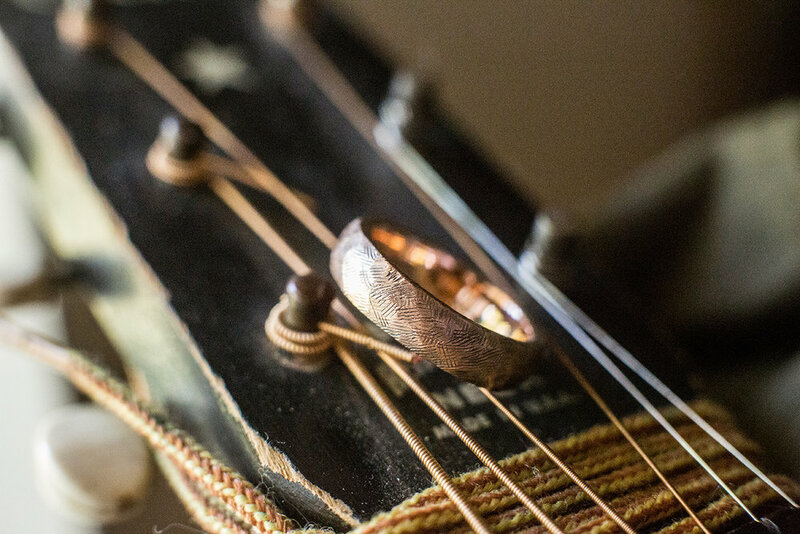 Dylan's hand carved Bourbon wedding band was an honor to create to symbolize their love. 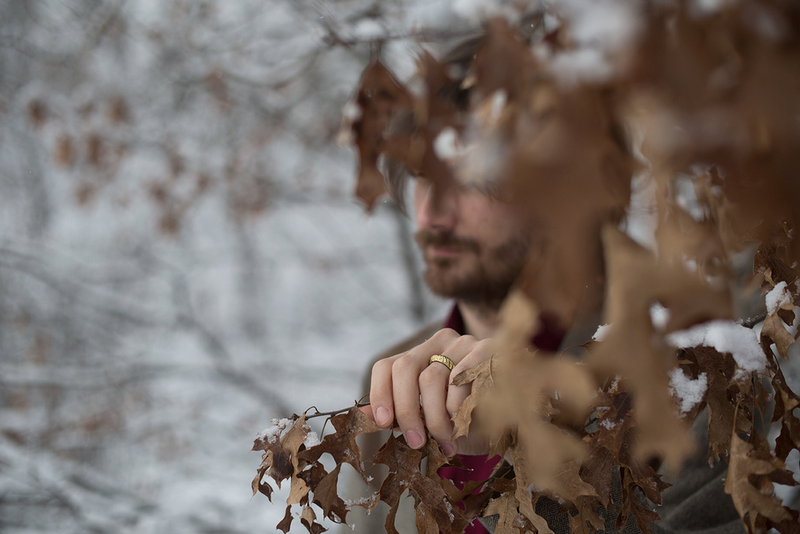 We're thrilled to officially release our new piece Bokeh. 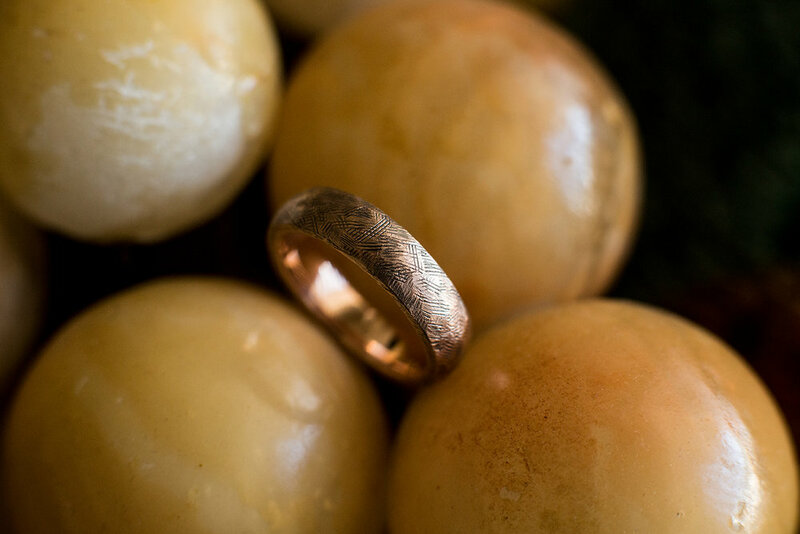 Many of our grooms were drawn to this texture from seeing it on a custom engagement ring we did awhile back, so we created a ring that shows off the design in its entirety. 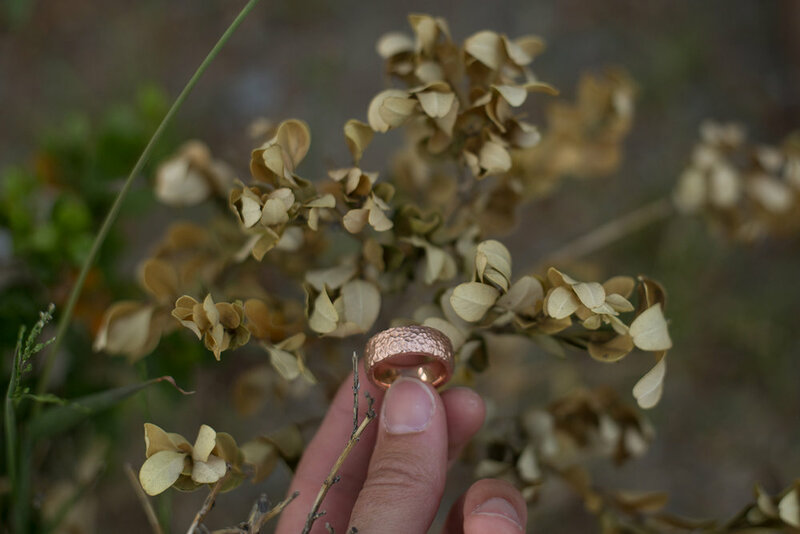 The band is hand carved at 8mm wide and casted in rose gold, but each piece is uniquely crafted and made to order giving you the creative freedom to choose a thinner or wider ring. 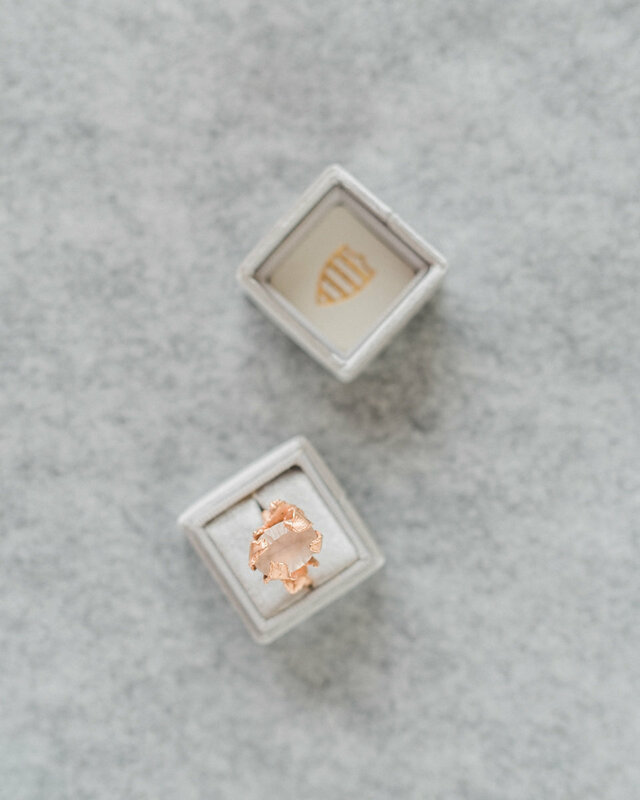 You can also choose a different metal as we work in white, yellow and rose gold. And don't forget about engraving, it's included with the piece to give you a chance to add a special touch of your story. You can view it in the shop here. The photos below are examples of what the piece looks like in a more feminine style and width. Rhodes bands are not just mass-produced, machine-made pieces of metal. 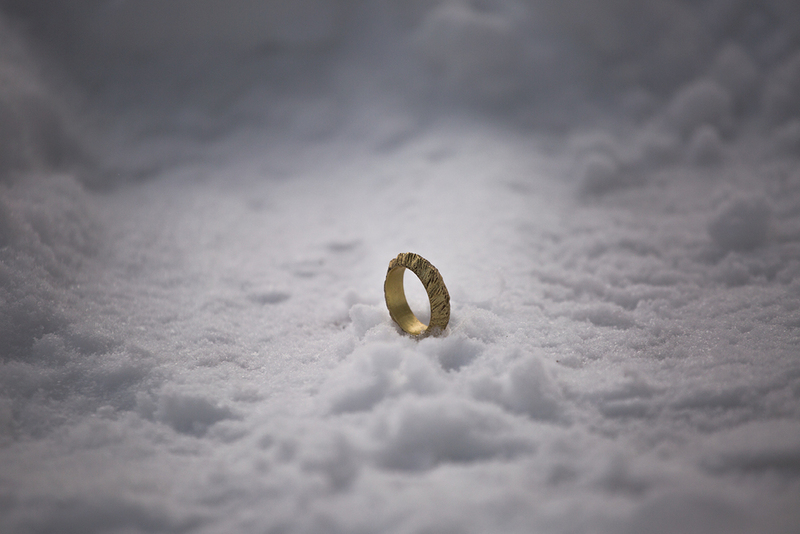 Each ring is hand carved in love, with love and is an heirloom that tells your story for generations to come. If this is the first time you're stumbling across us, we're happy you're here. I'm Jessy (hi!) and that handsome fellow is Perry. 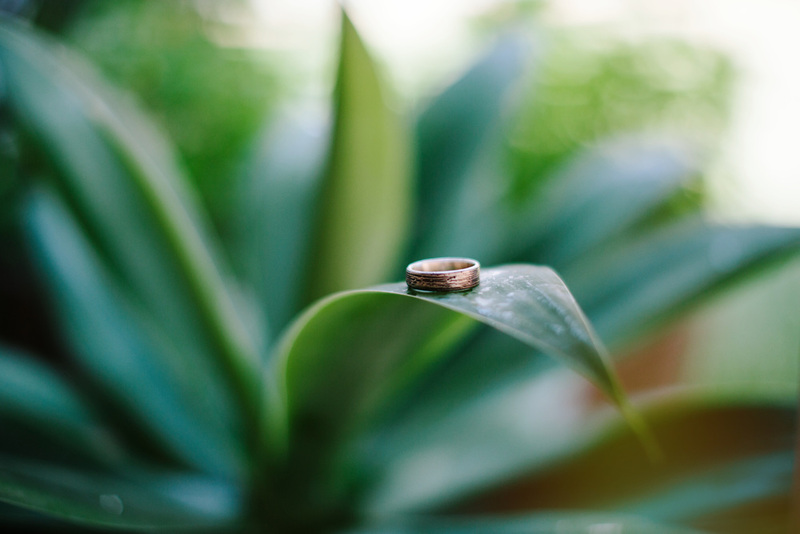 It's just us here at Rhodes Wedding Co. — from our website, to the ring creation, to the photography, we are working together on each piece. Thank you for choosing and trusting us to tell your story. If you have any questions before ordering please email us at info@rhodesweddingco.com. 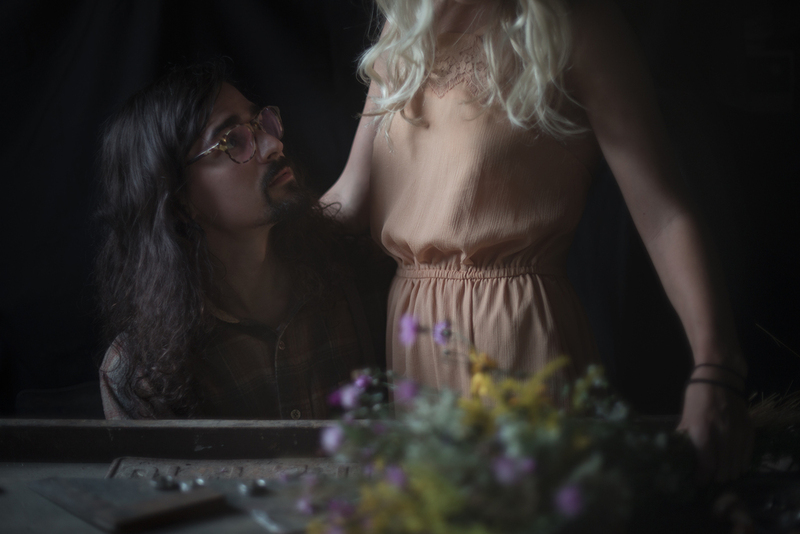 We'd love to get to know you + we'd be honored to create something for you and your love. Lately we've been working away on wedding band orders. We love creating each and every piece. 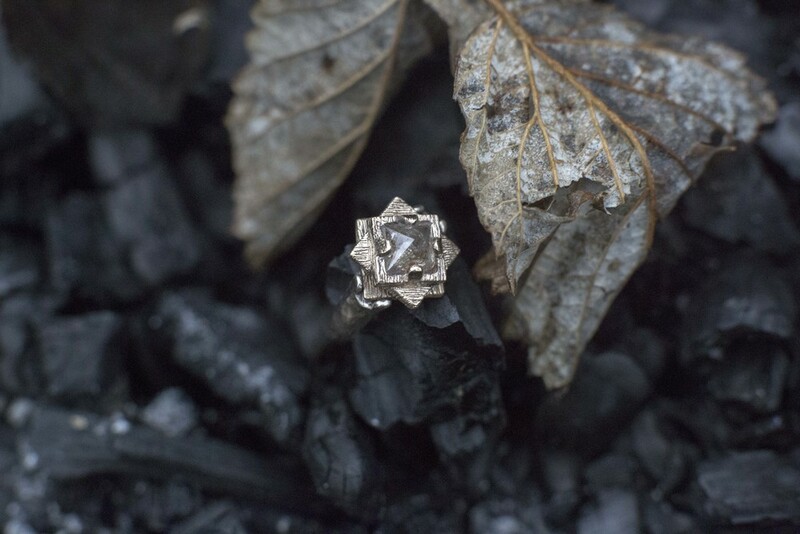 It's such an honor when someone chooses us to design their ring, making us part of their love story. 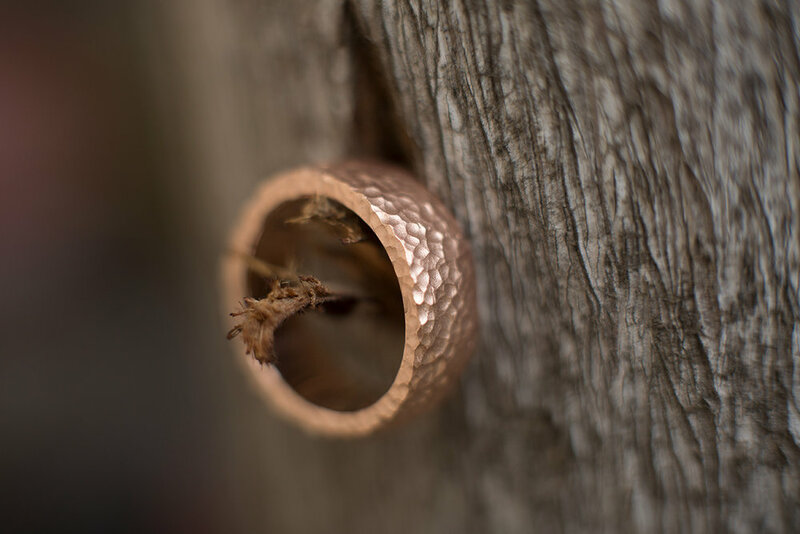 One of our favorite things about being creatives in the wedding industry is that we are not just crafting any piece of metal, we are crafting an heirloom. We are crafting something special that will stand the test of trials and the test of time. 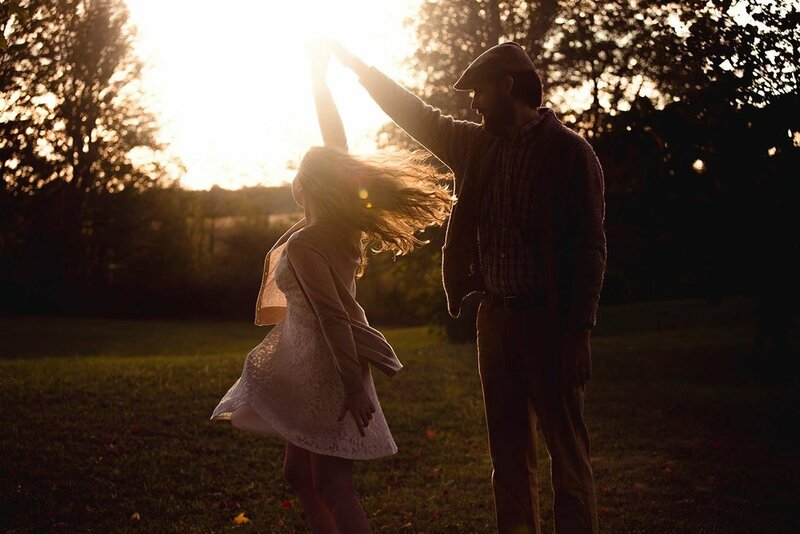 From the day after I met Brittany at a ska punk show, I knew there was something special about her. We started talking a little more every day until a little turned into a lot. Our mutual friends didn’t always agree with the relationship and often tried to make it difficult for us to be around each other, but true love always finds a way, right? Secretly holding hands under tables, late night rendezvous, and sneaky sneaky peck kisses at the end of the night when our chaperones (our mutual friends) weren’t looking. 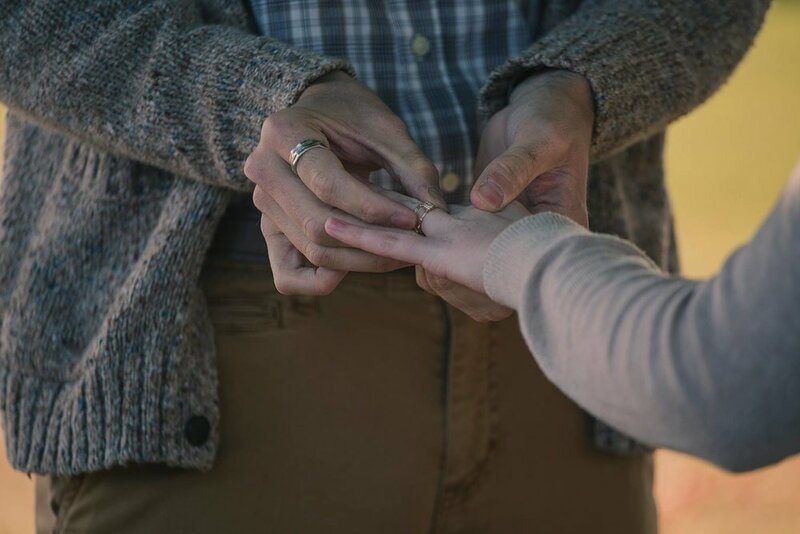 We have loved getting to know Wayne and Brittany, following their love story and creating her engagement ring and wedding band. The engagement ring is white gold with a delicate opal setting with a matching wedding band. If you would like to order something custom please e-mail us at info@rhodesweddingco.com. 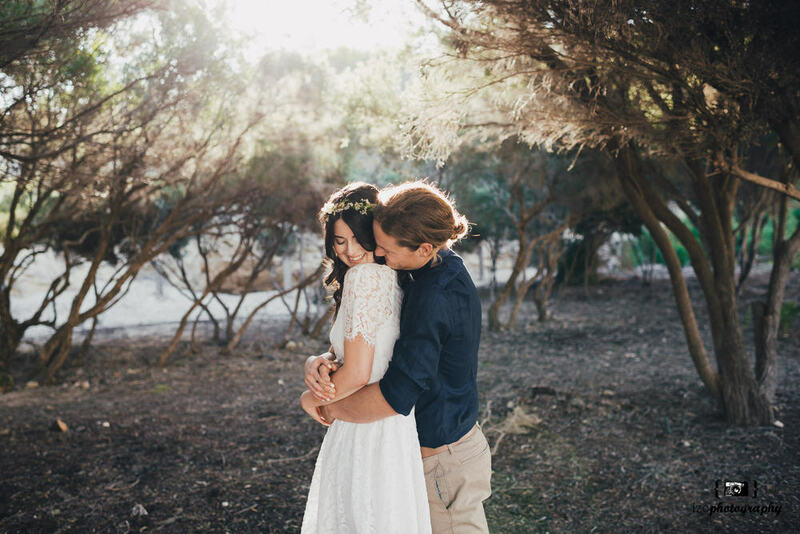 This wedding captured by the wonderfully talented Lara Hotz is so intimate that I couldn't resist creating a blog to share it with you. I was so moved as my eyes and heart took in this love story. 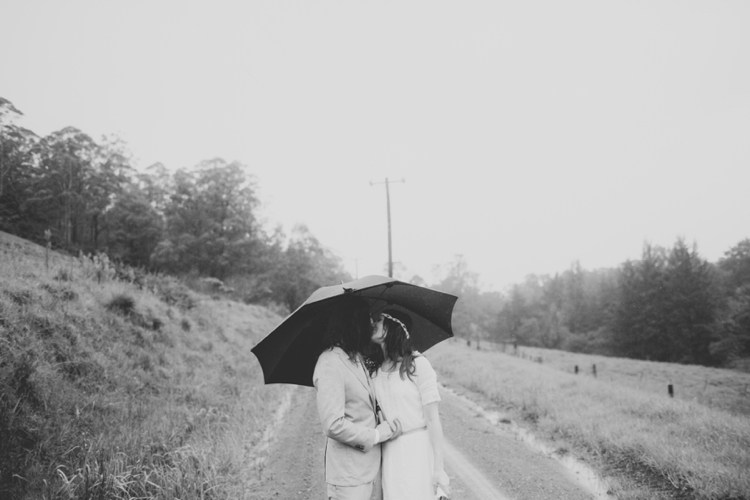 Watching this couple get each other ready for their special day, seeing them dance and play in the rain and getting to share those special quiet moments with them through the lens made my heart so full. Seeing their love truly reminded me of my love story with Perry. They love like no one is watching, and so do we. 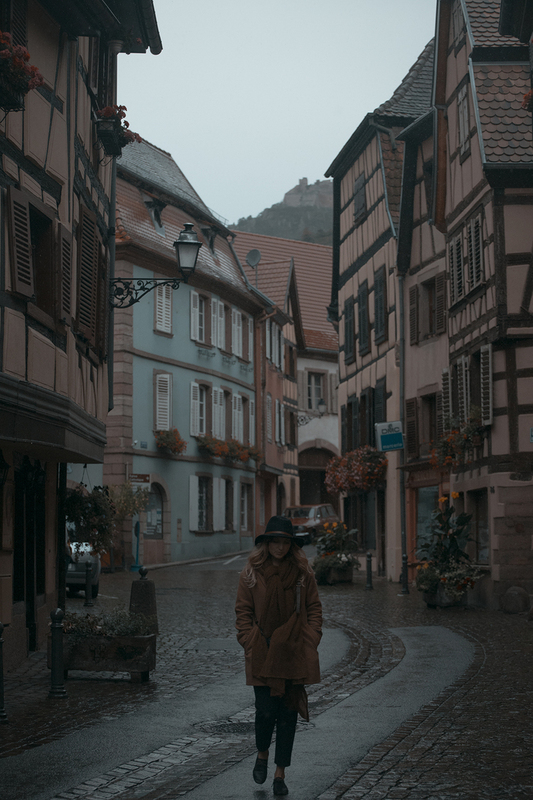 If you're an artist, filmmaker, designer, photographer and/or visionary who is playing a part in the world's great love story, we want to get to know you. Don't be shy, we'd love to tell your story. Email us at info@rhodesweddingco.com. 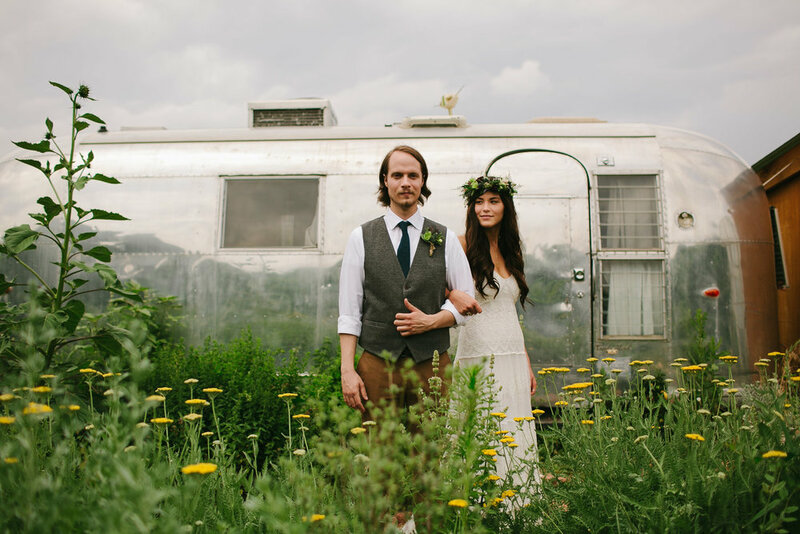 Captured Moments: Pop-Up Wedding Co. 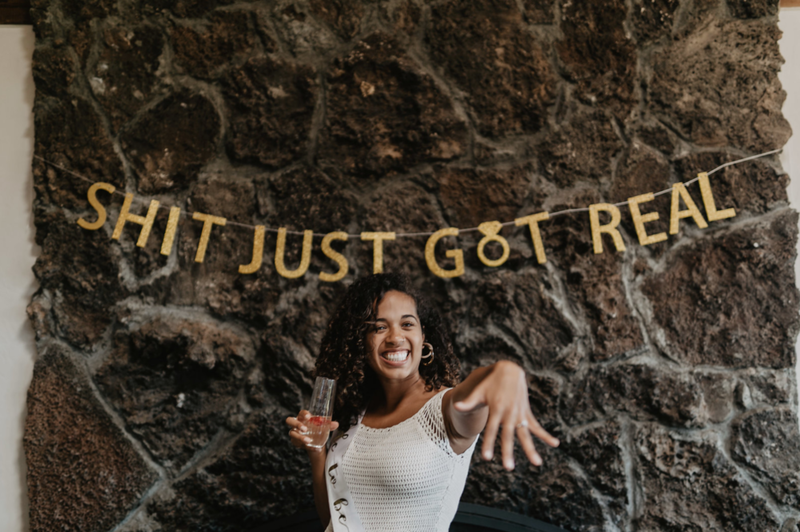 I was introduced to Brittany from The Pop-Up Wedding Co. through the lovely Lauren Campbell. 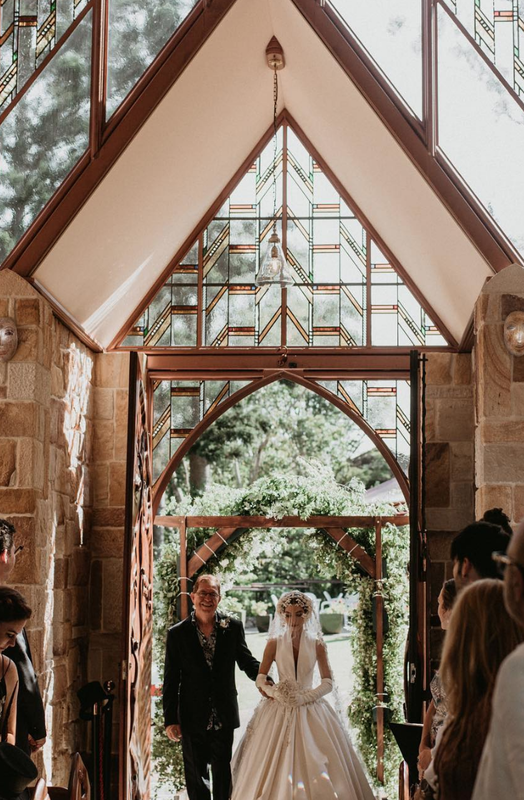 Britt and her husband Josh created The Pop-Up Wedding Co., Australia's original pop-up wedding company out of a desire to see couples have their dream elopement, no matter what that looks like. 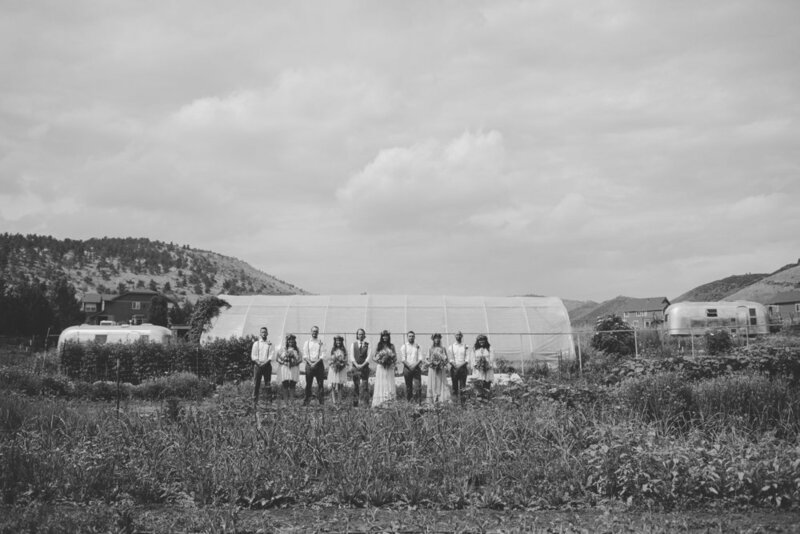 They believe that everyone is different and deserves a wedding that reflects who they are. They organize the best celebrant (Josh! ), they take care of the legal paperwork (yes, please! 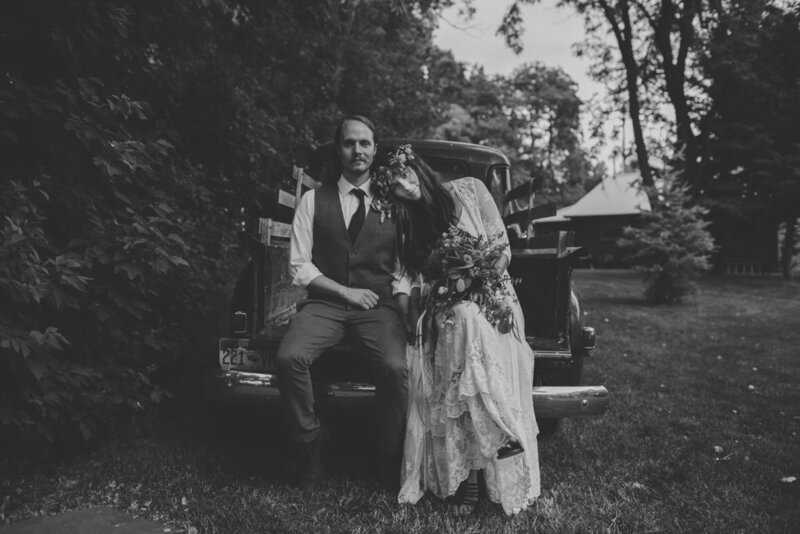 ), photography, venue, styling, and florist to host an amazing hour long elopement with a handful of your closest friends for your marriage ceremony and then you’ve got a quick photo shoot. Josh and Britt handle everything, so you don't have to. Have a look around their site and fall in love.